Wolves chief executive Jez Moxey says selling the Championship club on behalf of owner Steve Morgan is not proving easy as there are so few of the right potential buyers out there. The club have been up for sale for most of the season, following the revelation of Morgan's intentions in September. But long-serving Moxey told BBC WM: "We don't just want to sell to anybody. "Many of our older fans remember when this club nearly went out of business. We don't want a return to those days." He continued: "Despite what many people think there are not many people around with tens of millions that want to buy a football club. So many clubs are up for sale. So few get sold. "It requires someone, who will continue to run the club in a sensible, positive way without risking its future. This is a very precious, national sporting institution that stands for so many positive things, with its fantastic history and what it means to the people." "You can end up like Eddie Davies at Bolton," warned Moxey. "He has invested £175m, is no longer the owner, is not getting that money back and has taken all sorts of stick since Bolton were relegated out of the Premier League and now have been again out of the Championship. It can be a thankless task." Wolves found that out themselves when they were relegated from the Premier League in 2012 - and ended up falling all the way through to League One in the space of a year. After 18 months of managerial turmoil, they then found the right man to lead them back to the Championship in head coach Kenny Jackett - and Moxey said it helped having such a supportive owner as Morgan, who took over from club legend Sir Jack Hayward in 2007. "When you have an owner, you need to cherish them," he added. "The good ones are so few and far between. The next owner has got to carry on or improve on what Sir Jack Hayward and Steve Morgan have done." 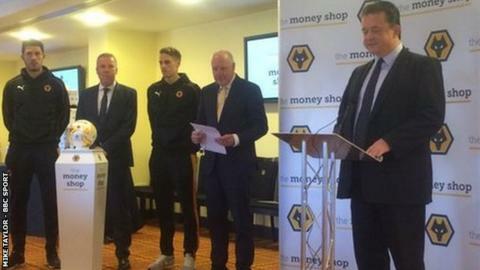 Moxey was speaking at Wolves' press launch to announce the new club's main sponsors, The Money Shop, the nationwide money-lending firm. They have been associated with the city since 2001, and the club for seven years, as sponsors of the 'home end', the Sir Jack Hayward Stand. The company have signed a three-year deal to become the new name on Wolves' shirts next season, but Moxey insisted it is the only deal that has been done so far. "There's nothing further to report," he said. "Other than that we're having conversations. People might hear rumours of me speaking with this person or seeing me in a meeting with that person. But, of course that's going on. My job is to find a new owner." Jex Moxey was talking to BBC WM's Mike Taylor.